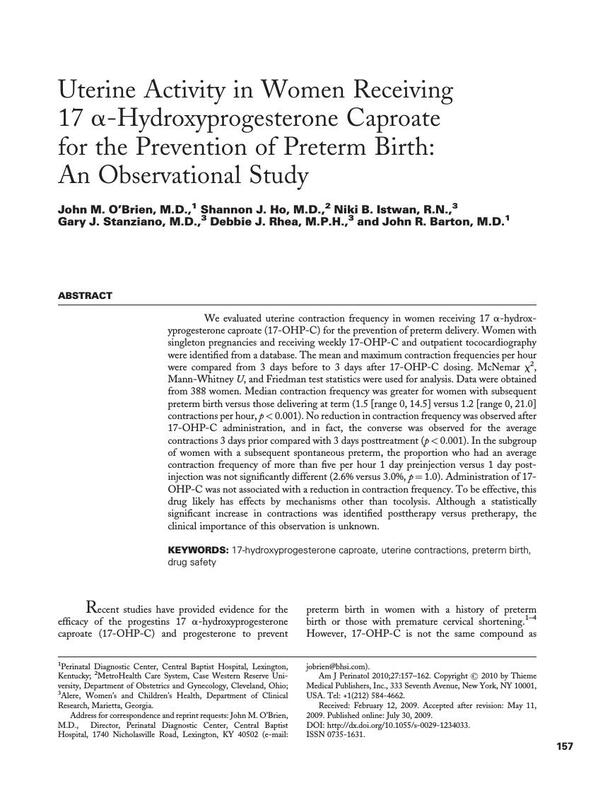 We evaluated uterine contraction frequency in women receiving 17 α-hydroxyprogesterone caproate (17-OHP-C) for the prevention of preterm delivery. Women with singleton pregnancies and receiving weekly 17-OHP-C and outpatient tococardiography were identified from a database. The mean and maximum contraction frequencies per hour were compared from 3 days before to 3 days after 17-OHP-C dosing. McNemar χ2, Mann-Whitney U, and Friedman test statistics were used for analysis. Data were obtained from 388 women. Median contraction frequency was greater for women with subsequent preterm birth versus those delivering at term (1.5 [range 0, 14.5] versus 1.2 [range 0, 21.0] contractions per hour, p < 0.001). No reduction in contraction frequency was observed after 17-OHP-C administration, and in fact, the converse was observed for the average contractions 3 days prior compared with 3 days posttreatment (p < 0.001). In the subgroup of women with a subsequent spontaneous preterm, the proportion who had an average contraction frequency of more than five per hour 1 day preinjection versus 1 day postinjection was not significantly different (2.6% versus 3.0%, p = 1.0). Administration of 17-OHP-C was not associated with a reduction in contraction frequency. To be effective, this drug likely has effects by mechanisms other than tocolysis. Although a statistically significant increase in contractions was identified posttherapy versus pretherapy, the clinical importance of this observation is unknown.